A luxurious single ended bath fitted with a luxury 23 jet whirlpool spa system in chrome with chrome controls available in 1500, 1675 and 1700 mm. Supplied with 0 tap holes. Your installer will drill these on site depending on the type of tap you purchase. The Granada bath also features chrome grips and a anti slip base at the tap end for assisted bathing/showering. Option to upgrade to 8 mm acrylic sheet, select the option above. 2 x Whirlpool Controls, one to turn the system on and off and one to control the air turbulence. 1 x 0.75HP Whirlpool Pump + all Pipe Work fully fitted. All our Whirlpool Baths and fully water tested before delivery. 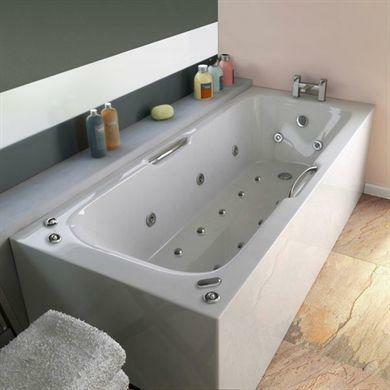 We offer a number of upgrades for this bath which include Lumbar and Plantar jet upgrades, if you would like to discuss any of these options prior to purchase please send us a message or call 0800 028 6174. Other popular upgrades include Underwater Chromotherapy Lighting, Panels and Taps. Special bath order was confirmed by phone and email as to exact specification required. Delivered as promised, time of delivery was confirmed by the driver. I am very satisfied both with the bath, the price and the service provided and would highly recommend The Whirlpool Bath Shop. Q: what do I need for an up grade on 1700 X 750 MM HIGHGATE DUO WHIRLPOOL BATH, including side and end panels. no taps please. is item already drilled?. what would make this bath complete? and please if I wanted this item by Thursday would i be able to get it please?, A quick reply from you would be appreciated. The price shown is for the whirlpool bath only, it doesn't include panels, taps or waste. The bath is not drilled for taps, your installer would drill these onsite. Our next delivery slots are w/e 17th Dec.